As manager of the Sacramento Methodist Assembly, Bryan Hall (1896-1989) was said to skip with enthusiasm from one project to another. The nickname “Skipper” was therefore used to describe the pastor who brought an abundance of energy and passion to his work. In 1980, I conducted an interview with Skipper Hall and began gathering information about a man who holds a special place in the hearts of the people who knew him and gained inspiration from his work as minister. What I learned has been used to publish a book titled Skipper Hall: The Life and Religious Philosophy of a Methodist Minister in New Mexico. In this blog I want to tell what I learned about the education Hall acquired in the 1920s at Southern Methodist University. In the process, I hope to introduce followers of this blog to a unique man and explain how SMU shaped him throughout his career as a minister. 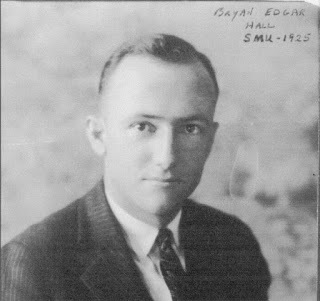 Hall graduated from Southern Methodist University in 1926 after serving as the school’s student body president during the 1925-26 school year. After leaving SMU, he served the Methodist Church for almost fifty years and was shaped throughout his career by the education he received at SMU. 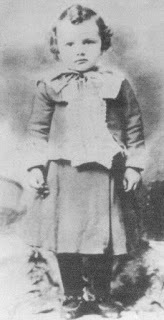 Hall had joined the Methodist Church at the age of seven and received the calling to become a minister when he was twenty and working at a laundry in Corpus Christi, Texas. He decided to join the ministry after listening to evangelical preachers in local churches and finding fault in what he described as their “unreasonable” and “goofy” descriptions of God. He especially disliked what he called their “negative” view of God. As he described it, “They made a big to-do about hunting for sinners, and there were no shades of grey. Everything was black or white." One day, a man who worked with Hall at the laundry asked, “Are you going to work here all your life? The Church could use a man like you.” When Hall explained that he didn’t have an education, the co-worker said, “Well, you can get one!” That conversation prompted Hall's decision to return to school. In 1919, at the age of twenty-two, Hall moved to Dallas to finish his high school education at Powell Prep School. He then entered SMU, and in 1925 received an A.B degree in history. Although he never had any doubts about becoming a Methodist minister, he majored in history due to his conviction that history demonstrated how humanity was gradually moving forward and improving. “Studying history and getting a historical perspective was, for me, more inspiring than studying the Bible,” he explained. Hall remained at SMU after earning his A.B. degree so that he could get an advanced degree in theology. After one year as a theology student, however, he had run out of enough money to continue and was advised by a professor to abandon the last two years he would need for the degree and leave SMU. Although Hall later felt the professor was accurate in his assessment that he had already learned everything he needed to know to work as a pastor, he also believed the professor had given him bad advice. “I might have gone further in the hierarchy of the church if I had stayed in school,” he said. Before he left SMU, Hall had learned enough to form a foundation that would hold his insatiable search for knowledge throughout his life. He particularly enjoyed the classes at SMU that taught him about the ancient world, classes about the Hebrew search for God and the Greek search for truth. He learned how the Gospels brought the Hebrew and Greek traditions together, creating a new religious philosophy stemming from the teachings of Jesus. What he learned at SMU stayed with him the rest of his life, and he was particularly grateful for professors named Giese, Goodlow, Kern, Rice, and Workman. During the 1920s, when Hall was a student at SMU, Christians in the United States were divided between “fundamentalists,” who accepted stories from the Bible as literally true, and “modernists,” who employed science and rational thought to explain what they read in the Bible. To this day, high school history students study the John T. Scopes trial in Dayton, Tennessee, a trial that embodied the fundamentalist and modernist arguments of the 1920s. 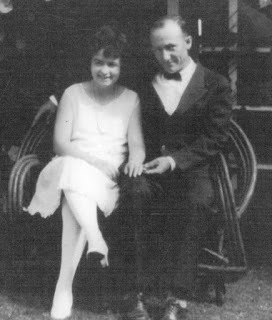 Although I never talked with Hall about the Scopes trial specifically, I have no doubts about which side he would have taken in the philosophical arguments presented at the trial. Scopes, a substitute high school teacher, was accused of breaking the law by teaching evolution, and Hall would have certainly supported the defense arguments of Scopes' attorney, Clarence Darrow. By Hall's own admission, he was a modernist. "[Rice and Workman] were simply bringing the scholarship of the last 150 years down to the level of lay people. They were training preachers to understand the scholarship so they could bring it to the level of the common people. However, the men running the school faced the fact that they couldn’t finance the school without firing the liberal thinkers. When the men running the school went to places like Lubbock or Amarillo — which were hotbeds of ultraconservative Church of Christ people — they would face controversy from fundamentalists and would not be able to raise money…. I didn’t know it then, but had they not fired our Bible teachers they could not have raised money, and SMU might not be here now. I couldn’t see that, and I was part of the protests. As I see it now, the president was forced into firing those teachers." After Hall left SMU in 1926, he sought an appointment as a Methodist minister in New Mexico and faced opposition due to the protests he had led as a student. Fundamentalists in New Mexico suspected the protests were evidence of his modernist beliefs, and they did not want a modernist working as a pastor in their state. In front of a committee organized to determine whether he should be accepted into the ministry, Hall confronted the same questions that had bedeviled the professors who were fired at SMU. Did he believe in the doctrine of original sin? Did he believe in the virgin birth of Jesus? Did he believe in the immortality of the flesh? Did he believe in the preexistence of Jesus? He was spared from answering these questions by the committee's chair, a man named C.S. Walker. Walker was well-versed in religious philosophy and sympathetic to Hall's situation. During the committee's interview, Walker cut Hall's answers short before he had time to elaborate on his modernist viewpoints. If Hall had answered the committee's questions without interruption, he would have told them about the ideas he had developed as a student at SMU. On the issue of the virgin birth, Hall would have pointed out that the Bible traced Jesus’ lineage back to Joseph, and he believed there was no point in tracing the lineage to Joseph if Joseph had not parented the child. Hall also believed the virgin birth made no rational sense. On the question of immortality he would have told the committee that his ideas did not involve the restoration of the physical body or the resuscitation of the flesh. Once, while passionately debating an issue of philosophy with an SMU professor, a student sitting across from Hall said, “Why don’t you shut up? Go make ‘em cry and get your money.” Hall could never have been that type of pastor. He had learned too much from his professors at SMU to view his obligation to the ministry so cynically. The interest in religious scholarship that Hall gained from SMU stayed with him throughout his life. When I interviewed him in 1980, he explained his religious philosophy with references to religious thinkers such as Dietrich Bonhoeffer, James Breasted, Harry Emerson Fosdick, Paul Tillich, and Leslie Weatherhead. He easily quoted passages from the Bible taken from different translations. He was also well-versed in the Biblical apocrypha, as well as the philosophy of John Wesley, one of the founders of the Methodist Church. Hall had not studied all of these religious thinkers at SMU. Like all college graduates, he still had much to learn after he left school. However, what he did learn at SMU provided him with an unquenchable desire to continue studying religious and historical scholarship. No school could hope for more than to inspire its students to a lifelong passion for learning. To that extent, SMU served Hall well. Hall left SMU with the dream of someday preaching in a town that contained a university. He thought he could make religion understandable to a congregation of well-educated people. 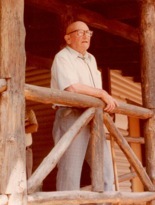 Although he served numerous communities in New Mexico throughout his long and distinguished career, he never had the chance to preach in a university town. Nevertheless, he served the small-town congregations of New Mexico with the dedication and commitment that helped improve the lives of everyone he met. John Wesley believed that we grow toward perfection even as our Heavenly Father is perfect…. I interpret that to mean that we forever move toward a richer maturity. We never reach the place where we are satisfied. I am continually growing, and I never reach the place where I say I am saved. Methodists do not believe that once a person has had an experience of salvation, that person is then saved. We believe that a person must continue to grow and develop as long as they live. There are some who grow senile and quit developing in the last years of their existence. However, the idea that we inherited from John Wesley is that we must continue to mature spiritually. For me, Skipper Hall serves as a prime example of a person committed to a life of learning, a person who is open to new ideas and prepared to abandoned outdated ideas of the past. He was a “modernist” in the truest sent of the word, someone who used his ever-expanding knowledge to make our world better. 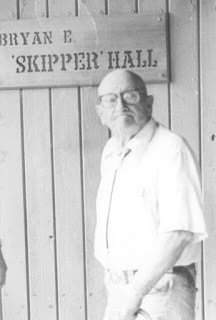 Skipper Hall acquired his nickname from the young people who worked with him at the Sacramento Methodist Assembly. Those who watched him move quickly from one task to another described him as “skipping” between jobs and events. No other moniker could have described his personality as well. He was a cheerful man who enjoyed all types of work, especially physical labor. He loved life, and he loved people. He rarely spoke ill of others and expressed few complaints about any aspect of his life. Skipper spent almost fifty years as a Methodist minister, confronting a culture of dogmatic religious beliefs that many of his colleagues would not dare question. Even so, he was never afraid to think for himself and challenge others to adopt social and economic justice as a cornerstone of Christian belief. He always ran a good church and provided the members of his congregation the spiritual guidance they needed to live better lives. Nine years before Skipper died I asked him whether I could interview him and put his story on audio tape. At the time, he was eighty-three and seemed pleased that I wanted to hear his story. When I arrived for the interview I discovered he had filled several legal pads with notes about what he wanted to tell me. By the time I left he had given me ten hours of his personal history and philosophy recorded for posterity. A transcript of that interview has been floating around his family for over thirty years. In 2011, I finally took the transcript and began editing it, cutting out the sections that were redundant, trying to make the spoken narrative more readable. My editing work has been published under the aegis of Suncrest Publications as Skipper Hall: The Life and Religious Philosophy of Methodist Minister in New Mexico. The book provides a first-person account of Skipper's life, a life that began in 1896, seven years before the Wright Brothers flew the first airplane and twelve years before Henry Ford introduced the Model T. The book also provides an account of Skipper's sometimes stormy relationship with the hierarchy of the Methodist Church. In the last section of the book Skipper explains his religious philosophy, a philosophy that sometimes served as a source of conflict with the church he served. All told, the book should satisfy a variety of interests — history, biography, church politics, and philosophy. To this day, I have met few people who impressed me as much Skipper Hall. When he died in March 1989, the words spoken at his funeral became a testament to the great number of lives he touched. Numerous people have lived better lives because they knew him, and if the book I have published contributes anything to keeping his spirit alive, I will consider it a success.